Treadmill or Stationary Cycle: Which Is Better for Aerobic Exercise? 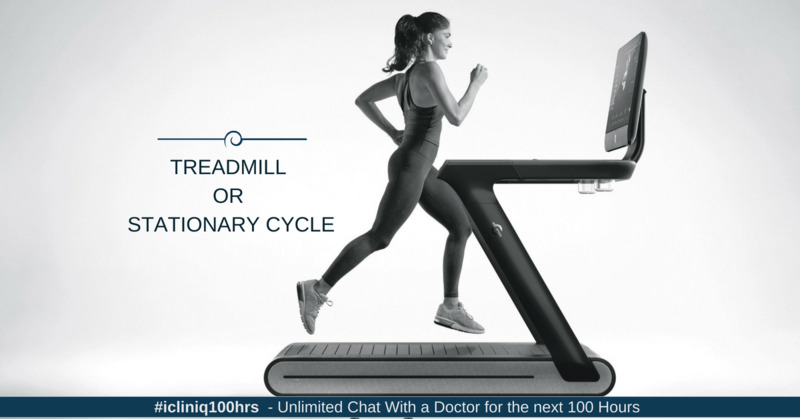 iCliniq › Ask a doctor online › Health Articles › Treadmill Test › Treadmill or Stationary Cycle: Which Is Better for Aerobic Exercise? Written by Dr. Mayank Agarwal and medically reviewed by iCliniq medical review team. Research has proven that the treadmill results in higher fat oxidation than a cycle ergometer exercise at equivalent exercise-intensity or workload done by children, women, men, athletes, and obese adolescents. The cardiovascular stress caused by treadmill walking is also less than that caused by cycling on an ergometer. It has been postulated that the sympathetic discharge is more after cycling than walking. Also, recovery of parasympathetic discharge is more delayed after cycling than walking. The net effect is that blood pressure reactivity is more for treadmill walking than cycling on an ergometer. What can be done to manage anger with dogs? If my treadmill test with echo comes normal, can I stop worrying about my PVC and PAC? It has been reported that cardiovascular response to treadmill exercise is less as compared to cycle exercise by obese or normal weight women. Similarly, it has been shown that exaggerated systolic blood pressure response to cycling occurred in young healthy males following a graded exercise test. Similar results were reported in young adults and sedentary women. Thus, in a nutshell, treadmill exercise will cause a lower burden on the cardiovascular system. Therefore, an individual can perform exercises for a longer duration or at a higher intensity as compared to cycling. The energy expenditure also seems to be higher in treadmill than cycle ergometer. It has been confirmed by studies that at equal perceived exertion, treadmill causes greater energy expenditure. However, it has been postulated that if we take into account the change in blood lactate levels and excess post-exercise oxygen consumption along with oxygen uptake during exercise, then the disparity in energy expenditure disappears. One must weigh the advantages and disadvantages of both the machines to achieve a better health-related quality of life. It must be taken into account that for certain specific individuals who have balance issues, the danger of fall from treadmill is greater. Do you have a question on Treadmill Test or Blood Glucose Level? Which waves in my treadmill stress test indicate problems?